Mildred was born in 1929 in West Pelton. She wasn’t sure, but thought that her family lived in houses by the Co-op. She went to school, not in West Pelton, but further down the village and then to a girls school from 11 years. Mildred didn’t pass the 11+ so at 14 years old she had to look for employment and applied for and got a job in an office in Chester-le-Street. She had been taught at school how to write an application letter and this proved very useful. Mildred was paid 15s a week for her first job. Not long after this, she applied for a job at the Co-operative Wholesale Society offices in Blandford Street. She had to have an interview and one of the tests was to write an essay. She was successful and at 15 years of age started working at the CWS at a wage of 18s a week. Mildred worked there from 1945 until 1957. This new job meant that Mildred had to travel from West Pelton to Chester-le-Street to Newcastle, arriving at the Marlborough Bus Station which was a short walk to Blandford House so she was in time to start work at 8.30am Mildred worked Monday to Friday (8.30 am to 5 pm) Saturdays (8.30 am – 12 noon). Most of the Blandford Street building housed the many offices of the CWS, including a bank. Although Mildred couldn’t remember her first day at the CWS, she remembered that she started off sorting post and after a while moved onto another office. There was no formal training programme and no apprenticeships – you were just moved onto different jobs and everyone accepted this. For a short time she worked in the telephone room and liked that – being the telephone girl – but then was moved back to a previous office because a supervisor regarded her as “one of her girls”. Everyone got on well together. The staff and supervisors were mostly women, and the supervisors were well respected. Mildred recalled that the General Office had a male supervisor/manager. Another job that Mildred remembered was working a punch card machine where information from invoices was converted onto punch cards. She suggested that this could have been the start of computerising information. 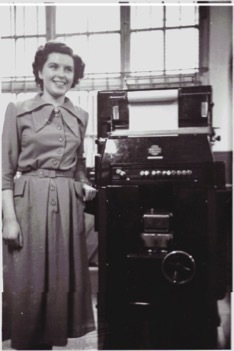 One of the photographs that Mildred let us copy, was of Mildred standing in front of this rather large machine! Mildred said there wasn’t really any encouragement to obtain further qualifications and women didn’t get as much pay as the men, even if they were doing the same job. She considered her wage at 15 to be OK. People didn’t question that men were paid more – that was how it was. Although she recalls paying subscriptions to a trade union, she wasn’t active in the union activities. Each year the wage was increased but you were 25 years before you got the top wage. It wasn’t easy to progress. The maximum holiday was two weeks, but again it took some time to get that. Mildred did remember that they got 2 days off for Race Week – the whole place closed down. Advantages of working for the CWS included being able to buy goods at discounted prices but staff had to join another retail society – St Anthony’s – as this was an easier way of getting the discounted goods. She also remembered the dividend being very good compared to today (and of course could remember her dividend number)! Mildred had brought along a photograph of a staff party – she said this was a works tea and thought they might have been allowed to finish work early as they weren’t allowed to stay after 5 pm. Another event was the yearly dance. This was on a Friday night in Blandford House. The top floor was used for this occasion, including the dining room (Mildred pointed out that it was not called the canteen!). After the dance, transport home was provided by the company. But staff still had to be at work at 8.30 the next day. Everyday staff took their lunch between 12.00 -1.00. There was a meal provided in the dining room (at a discounted rate) and all the staff ate there. There was a distinction though, with Managers, Buyers and Supervisors sitting at another part of the dining room. Talking about the lunch break she remembered that she and her friend would walk pass Stowell Street and get bananas from the men. Stowell Street was where the greengrocery buildings were; Waterloo Street housed the ladies millinery – she remembered going there to get measured for her wedding dress. Another distinction was that there were different entrances to Blandford House. The Directors used the main ‘posh’ entrance, supervisors and managers and employees used the side entrance which was overseen by a doorman (Fred Laidlaw);. Recently Mildred had a tour of the building and was interested to be taken into parts of the building that she’d never been into as a employee. She also went in through the main door – another first! Working at the Co-op was considered to be a good job – a step up and although there were no married women there when Mildred started, women didn’t have to leave when they got married although they did when pregnant. There was no question about staying on – you left when you were pregnant and Mildred left in 1957 about six months before the birth of her baby.